How you drive your vehicle depends on the type of policy it should be written on. Most people don’t realize or understand the importance of Business Auto. Why business auto insurance v. personal auto insurance? If you own a vehicle that is insured under a personal auto insurance policy and use if for business, you need a commercial business auto policy. An insurance company may not pay claims for any damages you incur, if the insurance company deems it was used in the course of business as a commercial vehicle. Why is it important to discuss with your agent how you use your vehicle? In order to select the right policy coverage for your vehicle business auto or personal auto, it is important that you disclose how you plan on using your vehicle. This will help to prevent any claims issues. How do I know if my car should be on a personal or commercial insurance policy? If you use your car for any business-related purpose, you need a commercial auto insurance policy. Did you know how to classify a commercial vehicle? Is driven by you or your employees for both business and personal use on a regular basis. If you use your personal vehicle occasionally for business use, it may be covered under your personal auto insurance. I would discuss with your agent how you plan on using your vehicle, whether it’s for personal or business usage. Your agent will advise you as to the appropriate policy is for your situation. 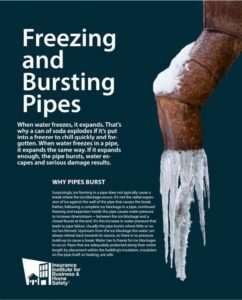 Do you know what to do in order to prevent freezing and bursting pipes? 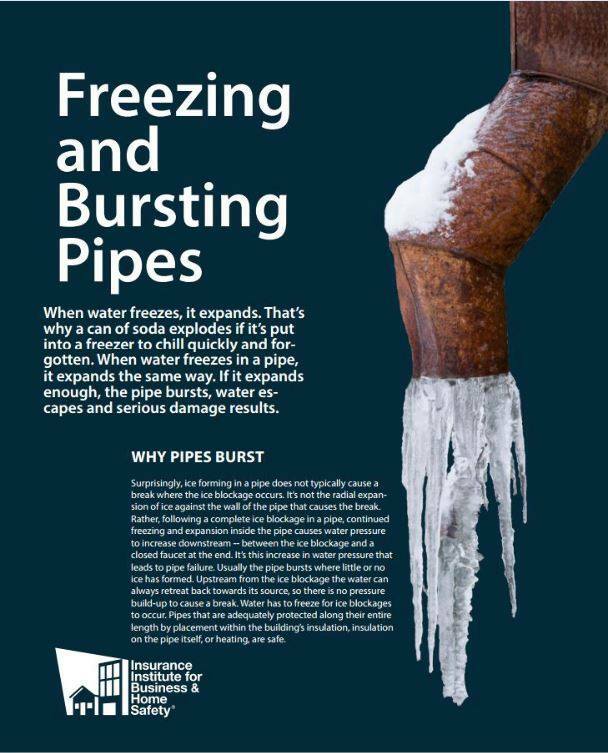 When temperatures drop or even reach subzero degrees you are at risk of your pipes freezing or bursting. 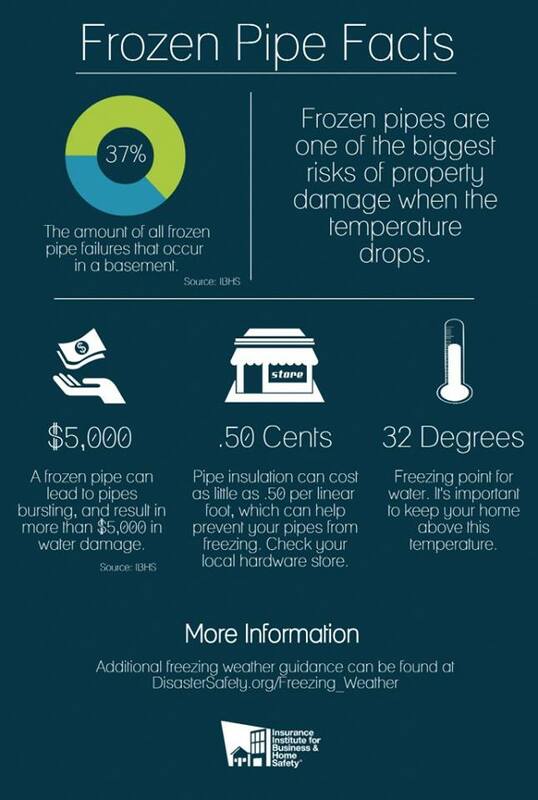 Pipes are most at risk in unheated areas such as basement, attic and garage. Once temperature start to drop and reach 20 degrees or below you should take necessary measure inside to keep pipes warm and water running. Keep garage door closed, especially if there are water supply lines in the garage. Open Kitchen and bathroom cabinet doors, this will allow warmer air to circulate around the plumbing, especially if your sink in on an exterior wall. Turn on cold water and allow it to drip from the faucet, allowing water to run through the pipes or even trickle will help prevent pipes from freezing. Keep thermostat set at the same temperature during day and night. During a cold snap is not the time to reduce your thermostat setting so you can save money on your heating bill. If you plan to be away during cold weather, leave your heat on in your home, and set no lower than 55 degrees. For the long term, add insulation to attics, basements, and crawl spaces. Insulation will maintain higher temperatures in those areas. To prevent drafts, seal cracks and openings around windows, doors, and at sill plates, where the house rest on its foundation. 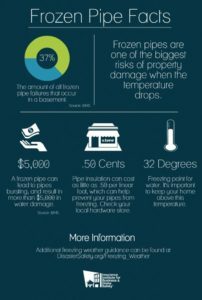 Do you know how to thaw frozen pipes? Tun on the faucet. As you heat the frozen pipe and the ice plug begins to melt, you want the water to be able to flow through. Running water through the pipe, even as cold as it is, will help melt the ice in the pipe. Apply heat to the section of pipe. Use an electric heating pad wrapped around the pipe, a hair dryer, or a portable space heater, or you can wrap pipes with towels soaked in hot water. 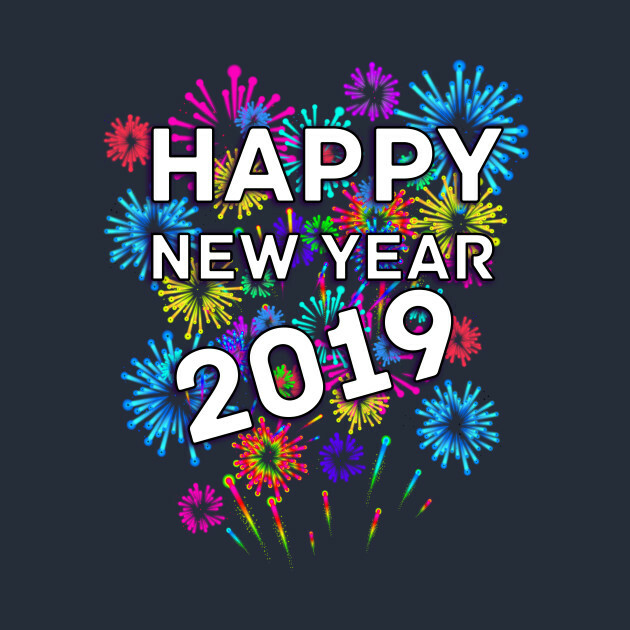 DO NOT USE – a blowtorch, kerosene or propane heater, a charcoal stove, or any device with an open flame; the high heat can damage the pipes or even start a fire. Apply heat until full water pressure is restored. Make sure you check all your faucets in your home to see whether you have additional frozen pipes. If one pipe freezes, other pipes may too. Call a licensed plumber if you are unable to locate the frozen area, if the frozen area is not accessible, or if unable to thaw the pipe.